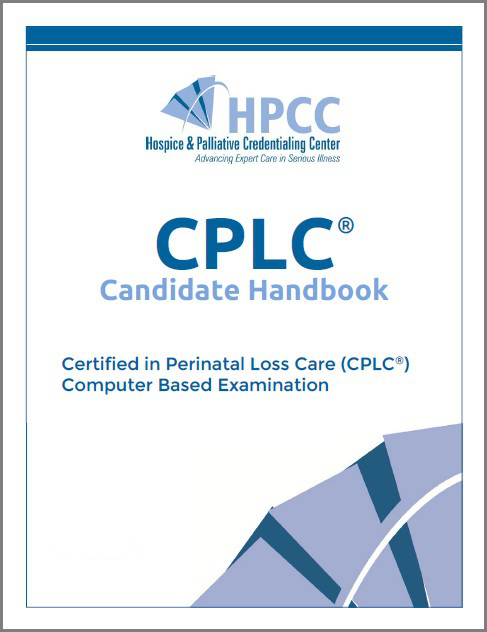 The Certified in Perinatal Loss Care (CPLC®) examination was designed for professionals in a health care role that provide to those experiencing perinatal loss. To be eligible, the applicant must fulfill the following requirements by the application deadline. Hold a professional degree and appropriate current, unrestrictive license in the United States or its territories a registered nurse, physician, psychologist, counselor, child life specialist, social worker or chaplain. Have evidence of work in their profession and the area of perinatal loss care and/or bereavement support for a minimum 2 years within the past 3 years. The development of all certification examinations begin with a Role Delineation Study (RDS), where through the link you can find out more information. Specifics related to the eligibility criteria for each exam are provided in the candidate handbook. These MUST be reviewed prior to completing an application. The Hospice and Palliative Credentialing Center has partnered with the testing service PSI/Applied Measurement Professionals (AMP) to offer this online exam application process listed below. Paper applications are also available and are located in each candidate handbook. Applicants MUST submit a paper application if requesting special testing accommodations (ADA related). Choice of test assessment center if scheduling appointment online. Test locations are the same for all exams. Applicant provides personal data and choice of specialty exam on application form housed on a secure AMP website (Please provide your HOME address on your online application as ADDRESS 1) by the online application deadline date. Current membership status in HPNA. Applicants must have their HPNA membership number in order to receive a member discount. If an application for a new HPNA membership has been made the same day as an application for a certification exam, the non-member exam fee will display, and the applicant must agree to pay the non-member fee to complete the exam application process. Applicant reviews information and agrees. Applicant completes process of applying for the next scheduled certification exam which includes provision of credit card information for billing at time of application. The applicant will receive online verification of application receipt from the testing company, PSI/AMP. The current online application is for the upcoming certification exam window only, and the application must be received by the testing company on or before 11:59pm Central Time on the exam deadline date. For clarification of any specific concerns or questions, contact the HPCC national office via email at hpcc@goHPCC.org or by phone at 412-787-1057. Test site locations for computer-based certification testing are determined and available through the testing vendor, PSI, Inc. (PSI). These locations are subject to change. Locations are the same for all HPCC certification exams. HPCC currently offers two options for CPLC® recertification. A CPLC® can renew their certification by fulfilling practice hour requirements and sitting for the computer-based exam again or they can renew through the recertification process known as the Hospice and Palliative Accrual for Recertification (HPAR). The HPAR process requires fulfilling practice hour requirements and the accumulation of 100 points of professional development activities over the preceding four years. Points can be accrued through continuing education, academic education, professional publications, professional presentations, precepting students, orienting staff, and volunteer service in professional organizations. Each area varies as to how the points are calculated and how many of the total points can be obtained by that method. Each activity MUST correlate with the test content outline. More details and instructions are in the HPAR packet for CPLC®. The packet is updated yearly. Be sure that you are using the current HPAR packet for CPLC® (dated in the bottom left corner) which corresponds to the year that your recertification is due. The packet contains the instructions, test content outline, application, category logs, and summary log, with fee structure and deadlines. Those renewing their CPLC® credential should use these packets as their guide, and not use the online HPAR options for ACHPN® and CHPN®. If you have any questions, please contact the national office at 412-787-1057 or via email at hpcc@gohpcc.org. This is a free resource created to assist those looking to verify a professional's HPCC certification status. Names of individuals currently certified by HPCC are available through the link below.